Mary Hoffman has written a very wide range of books for children and young adults, including the Stravaganza series, the Amazing Grace books, historical novels, and non-fiction. Mary Hoffman's book Venice Noir was available from LibraryThing Early Reviewers. 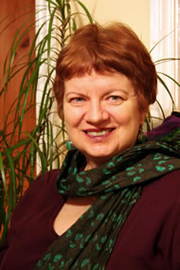 Mary Hoffman is currently considered a "single author." If one or more works are by a distinct, homonymous authors, go ahead and split the author. Mary Hoffman is composed of 3 names. You can examine and separate out names.